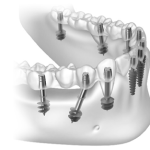 Basal implants are relatively new to the technology. They are considered to be a revolutionary method of fixing the teeth using dental implants. The highlight of these kinds of implants is that, they do not require bone graft and bone augmentation. Even most complicated cases can be done without bone graft and bone augmentation. The invention of basal implant made it possible to restore teeth even if there are no teeth. They can be even placed areas with insufficient bone as they have such kind of special form and shape. First, the dentist will prepare the patient’s mouth for the implant. Anesthesia will be given after that using STA-Computerised injection system, which is absolutely painless and accurate. The planned teeth will be painlessly extracted after that. Implant will be placed using keyhole or flapless method. After placing the implant, the doctor will take digital opg-dental X-ray to check the accuracy and position. Prosthetic specialist will take impression. The dentist will also check the bite and jaw position. Fine tuning and other procedures will be done in the following days. Basal implants are economical than the traditional ones. Placing them is not a risky task and doctors’ work is also less. Even smokers can also get basal implants.